SMS, chats, posts – a new kind of writing has established itself in our everyday lives. Spelling and punctuation play an ever diminishing role. This is not unproblematic, thinks writing coach and journalist Markus Reiter. Mr Reiter, what do you think, as a language coach and former newspaper editor, when you read SMS messages or chat correspondence? I see it as an insider language, as a kind of written sociolect. For example, when I read what a fourteen year types in a WhatsApp, the numerous abbreviations lead me to find out what they mean. Do you find that worrying? No, not in principle. Teenagers have always tried to set themselves apart from adults through their own kind of language. Language serves not only communication but also always distinction. What worries me is another aspect of contemporary writing. I’m struck by the fact that many writers – well, not only teenagers in chats but also professional writers – have developed an increasingly lax attitude towards their texts. It seems almost as if a certain kind of writing that is common in text messages has found its way into longer texts. You notice this, for instance, in the disappearance of the comma. What’s so problematic about that? If the comma disappears from WhatsApp messages, it’s no major catastrophe. It becomes a problem in longer texts, which lay claim to giving the reader access to more complex thoughts – not only what you just ate for lunch. 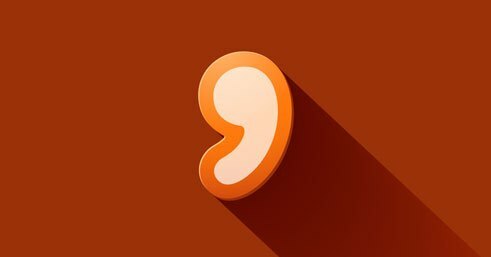 Punctuation signs were invented for a good reason: to divide sentences into segments of meaning and so to facilitate the readability of texts. Since when have we been using full stops and commas? In the early Middle Ages people still did entirely without punctuation signs. They didn’t even bother to separate individual words from one another by spaces. During the twelfth century, writing monks began more and more to subdivide their texts into grammatical units such as main and subordinate clauses. This made reading noticeably easier. The fact that it is the way it is has to do with how the brain processes texts. Research has found that for common terms we store up word images, which we compare to the former when we read. If the word images correspond well, we grasp the meaning quickly; if not, we have great difficulty. Could it therefore be said that we’re experiencing a kind of regression to a textual orality, which for good reasons we left behind us long ago? Here we have to make distinctions here. In principle the approximation of writing to spoken language is a very positive development. As a rule, texts that we attempt to write as we speak are more comprehensible. In the Anglophone world there’s a marvellous tradition of enriching scientific and scholarly texts with narrative elements. But that is an art and requires hard work on the text. Though the other kind of written orality, on the contrary, is marked by taking too little pains with writing. Anyone who thinks he can scribble down a text for a wider audience just as he does a Facebook entry for his friends hasn’t understood how much effort this imposes on his readers. Basically, the ideal would be to master both kinds of language: the peer group code and the standards of a generally comprehensible language. Unfortunately, in my seminars I experience again and again that a switching from one language code to another is extremely difficult. If you ask marketing- and IT experts to make their language code comprehensible to a non-insider, many simply can’t do it. It’s often only then that you notice how much this way of speaking is influenced by the wish to cover up the imprecise by the impressive-sounding. This by the way is also a problem for communication within a company. I often hear: my boss constantly sends me incomprehensible mails and we then try to discover what he really wants to tell us. This isn’t only disrespectful to the staff but also costs working time. In what way do you think how we write will develop? That’s hard to say, because language is subject to a strong dynamics. Perhaps writing will again become an elite project. This was once the case and that it will again become the domain of experts is not, in my opinion, impossible. Many people will then read less and listen more and watch more videos. You already need much fewer reading and writing skills today than before. But isn’t it constantly being pointed out that precisely the younger generation is writing more than ever? That’s right. But the interesting question is how formats will continue to develop in which we no longer communicate through texts. Take, for example, Vine, a service for sending ultra short videos. Or the app Snapchat, which is primarily for sending photos. Or audio device-control. Perhaps we’ll experience an increasingly oral use of language which, when it’s written down, will reveal a kind of written orality. Markus Reiter | © Markus Reiter Markus Reiter is a language coach, journalist and writer. Among other things, he has been features editor of the Frankfurter Allgemeinen Zeitung and is the author of books on culture, language, neurosciences and communication.